Judge Lewis W. Wetzel in Luzerne County sustained in part and denied in part a UIM carrier's objections to discovery of insurance reserves in the Post-Koken case of Migatulski v. Nationwide, Eberts, et al., No. 7269 - Civil - 2006 (Luz. Co. Sept. 7, 2010, Wetzel, J.) which case involved claims against various tortfeasors along with underinsured motorist benefits and bad faith claims against the UIM carrier. The Court also issued a more recent October 25, 2010 Order denying the Plaintiff's Motion for Reconsideration. Judge Wetzel granted the Plaintiff's Motion to Compel the UIM carrier to produce a privilege log of documents as well as the work product of the adjusters handling the first party and underinsured motorist claims of the plaintiff. The UIM carrier was permitted by the judge to redact impressions, conclusions or opinions of the adjuster directed to the UIM carrier's defense counsel. The UIM carrier was also allowed to withhold any information deemed to be protected by the attorney-client privilege. Any information claimed to be privileged for any of these reasons was subject to a further in camera review by the court if requested by the Plaintiff. The above parts of the Order are consistent with other decisions on the extent of discovery allowed in Post-Koken matters involving bad faith claims. Those decisions may be reviewed in the Post-Koken Scorecard by scrolling down the right hand side of this blog and clicking on the date listed under "Post-Koken Scorecard." The Judge further ordered the UIM carrier to produce any claims handling manuals pertaining to first party claims and UIM claims. The Order stated that both parties were bound by a previously agreed upon confidentiality clause pertaining to that disclosure. Judge Wetzel's decision is also notable for his handling of the issue of the Plaintiff's attempt to discover the UIM carrier's reserve information in this context. In his Order, the judge refused to allow for the discovery of the first party or UIM reserves information. In so ruling, the court relied upon the Superior Court decision of Peco Energy Co. v. Ins. Co. of North America, 852 A.2d 1230 (Pa.Super. 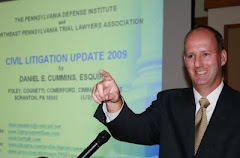 2004), which also held that such information was not discoverable as reserves information kept by carriers was a means by which a carrier, as required by the Pennsylvania Insurance Commissioner, put aside money to cover the potential worse case scenarios of claims in order that the carrier may see what needs to be done to remain solvent as opposed to the reserves being any reflection of the carrier's assessment of the true value of claims presented. This ruling may come to serve as a roadblock for insureds who try to obtain and use reserve information in an effort to assert that an offer by a carrier on a claim less than than the amount of reserves constitutes a bad faith offer on that claim. Anyone desiring a copy of the original Order and Reconsideration Order of Judge Wetzel may contact me at dancummins@comcast.net. I thank Attorneys Charles J. Haddick and Bryon Kaster, both of the Harrisburg, Pennsylvania office of Dickie, McCamey & Chilcote, P.C., for forwarding this decision to my attention. I also note that Attorney Haddick is the writer of the Insurance Coverage and Bad Faith Blog, which can be found at http://thelegalintelligencer.typepad.com/tli/charles-haddick/ .